When I was in my 40's and very fit I thought about hiking the Appalachian trail. I didn't want to do it by myself. I wanted someone with me if an emergency arose. Had I read the following book I may of rethought it. I certainly felt like a whimp after reading Grandma Gatewood's Walk: The Inspiring Story of the Woman Who Saved the Appalachian Trail. 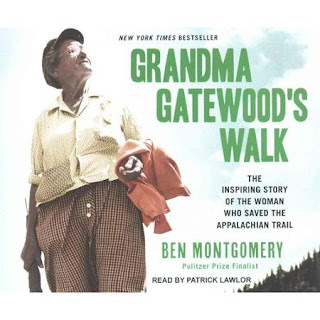 Emma Gatewood was 67 years old when she started the Appalachian trail. She didn't have hiking boots, she wore Keds sneakers. To protect her from rain she had a shower curtain. This 5 foot 2 inch wonder carried a 12 pound sack which included bullion cubes for nourishment. Her walk took place in 1955, when america was kinder. She would knock on a strangers door and ask if she could have shelter for the night. Some people provided not only a bed but a warm dinner and additional food for the journey. This is a fantastic book and I just happen to see it on my audio book list. When I finished the book I searched for additional information on Emma. About Emma has photos of the sneakers she wore, Emma with her sack and many other articles about this amazing lady. Maybe you will become inspired after reading the book. You might not hike the trail but try something new. A new challenge awaits. "Grandma Gatewood" was one amazing lady alright! I can't imagine walking that far. You're right Linda-the world was a MUCH kinder place when she made that trek. I'd be afraid of hiking ANYWHERE alone today. My Mom never drove and always enjoyed walking. My girlfriend and I were talking the other day and agreed that all the walking she did probably kept her as physically healthy as she was well into her 90s......definitely made her heart strong for sure. I love to walk. Rip and I would clock many miles. When I wanted to do the trail I even thought of taking Rip with me. Never worked out. Guess there was a reason huh? Emma led a remarkable life for sure! If you'd like to find out more about her, I've been working with Eden Valley Enterprises and FilmAffects in a project to document her life. You can find out about the project at http://edenvalleyenterprises.org/progdesc/gatewood/gtwdinf.htm and be sure to check out our calendar page (http://www.edenvalleyenterprises.org/progdesc/gatewood/gatewoodcalendar.htm ) for places where you can see one of our programs about her. Thank you so much for stopping by. This book came to me at the perfect time in my life. I don't think I will hike the trail but she has inspired me to try things I never would of considered. I recommend the book to everyone.Next week I will "party" the link so others might click and learn more about Emma and the project. I want to read this book. Emma really is an amazing woman. I can't imagine walking 2000 miles with no one with you and braving all the elements and the animals out on the trail. I am also amazed, how back then, that they arrested Emma after her husband beat her. What a long way we have come. And then to see she did the walk again. Wow, what an inspiration. I doubt very much anyone in this day and age would attempt to do this alone, but she is one brave woman. Thanks for sharing this Linda, I am going to look for this book next library visit. It's a wonderful book. Do you think some of your facebook friends might like it? I love reading. Wow what an amazing lady.I miss my walking very much. Myra knows how it is with how the ears and dizziness can slow you down. I am going to try my block again on my good days . No you can't trust folks like you used to.So sad when there are still so many nice folks out there. Do they have Emma's sneakers in a museum ? What an interesting story. Looking forward to reading the book & luckily my elibrary has it. So, just a short wait till it is available. Thanks, Linda. It was a really good book and hope you enjoy it as much as I did. Sounds inspirational. I'm adding it to my reading list. Wow this sounds like a fantastic book. I love books about strong women! So do I! Any good ones you would like to recommend? That's so neat; we're going to have to read about her! I've encountered stories about her in other books I've read on the AT, but I didn't realize there was a book just for her. Excited to check it out! So happy I was able to pass the information on. I usually don't link books to parties but this one was so good I had to share. This sounds like a good book to read! The book is wonderful! Hope you like it.